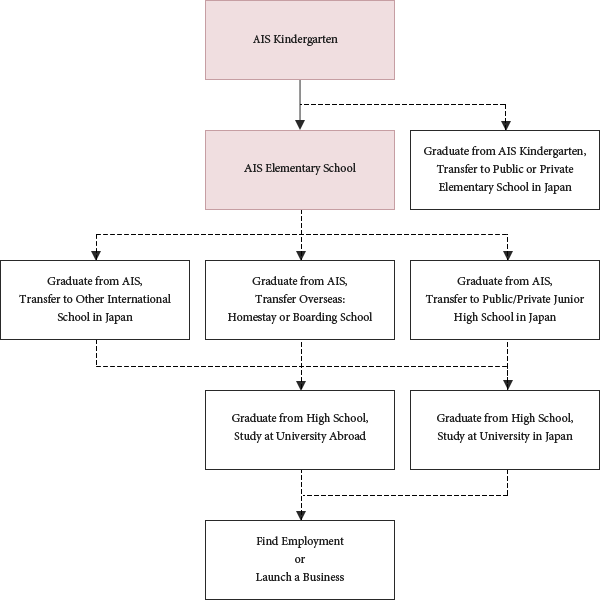 AIS strives to support all graduating students into their chosen future study path. Since our first graduates in 2012, to date 33 students have gone on to enter a variety of international schools and private junior high schools throughout Japan and beyond. International schools are an excellent path to continue in a complete English education curriculum after AIS, particularly if contemplating higher education at an institution abroad. A number of our students have gone on to prestigious private schools in Japan. However, if you and your child are considering a private Japanese junior high school as an option, please be aware that entrance exams in Japanese are required for admission.